Avoiding West Nile Disease: The Time of Day Really Matters! The US is in the midst of what appears to be the worst outbreak of West Nile disease since 1999, when the disease was first detected in America. While the risk of becoming infected is very small, and the number of fatalities is infinitesimal compared to a normal flu season or automotive fatalities, members of the public are concerned. There is a lot of misinformation out there. For example, various people advocate fabric softener sheets, vitamin B-1 pills, Vicks Vaporub, vanilla to ward off mosquitoes. Others have suggested abstaining from (or consuming!) bananas is the key. The advice of the CDC is probably the best. It includes the advice "Consider staying indoors at dawn, dusk, and in the early evening, which are peak mosquito biting times". However, this advice is a little vague, just how long before and after dusk? Moreover, there is danger that this advice will be ignored, drowned in the noise of other more dubious advice. 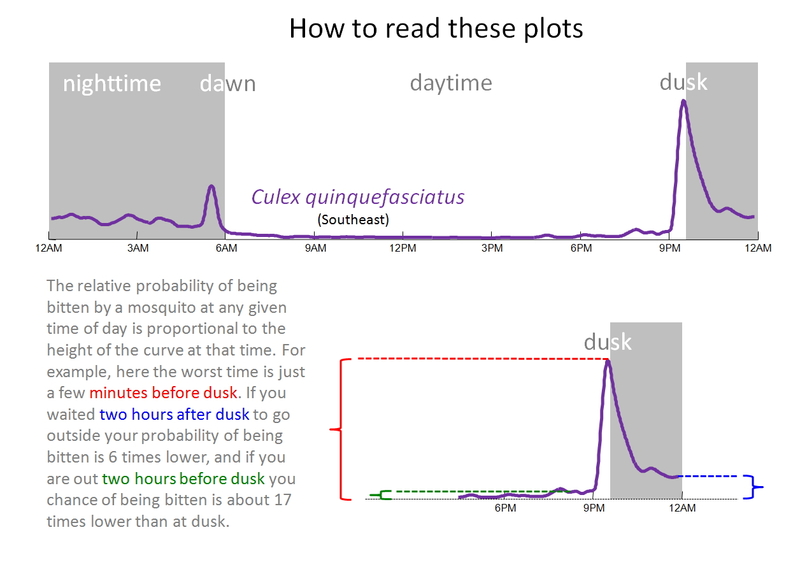 The Computational Entomology Lab at UCR has produced simple graphics to allow people to visually understand the importance and utility of avoiding the outdoors at dawn and dusk. Using sensors to detect insect flight, we have monitored several species West Nile vector mosquitoes for their entire lifespan, in order to produce daily activity plots. As shown below, these plots strongly confirm the CDC advice (this figure helps you understand how to interpret the plots). For example, assuming you get up after dawn, and you need to spend most of your day outdoors: if you can manage to go indoors an hour before sunset, and stay indoors until an hour after sunset, your chances of being bitten by a mosquito is about two hundred times less than if you had spend those two indoor hours taking a noontime siesta, but stayed outdoors to watch the sunset. These graphics may be reproduced anywhere by anyone. All we ask that you give due credit, and if possible, have a pointer to www.cs.ucr.edu/~eamonn/CE/WestNile/ This youtube video explains how we captured the data. These plots are for female mosquitoes only, as only females are vectors. These plots measure flying activity, not biting activity. However, we expect these to be near perfectly correlated. This data was collected in a lab, not in the wild. However there is little reason to think that this makes any difference. These plots should not be considered medical advice, as we are not qualified to give it. We are not responsible for anything that happens to you, based on your viewing of these plots. Other researchers have measured daily activity plots before. However they typically measured only dozens of datapoints. What is different here is that using our sensors we can measure millions of data points with ease, to produce the most accurate plots. Data analysis: Yanping Chen, Computer Science, University of California - Riverside. Insect care: Adena Why, Dept of Entomology, University of California - Riverside. Sensor design: Gustavo E. A. P. A. Batista: University of Sao Paulo - USP. Principal Investigator: Eamonn Keogh: . Professor of Computer Science, University of California - Riverside. Acknowledgments: Our work is funded by Vodafone's Wireless Innovation Project. We thank them for their incredible support. Our early research was funded by a Bill & Melinda Gates Foundation Grand Challenge Award, a Smarter Planet Award from IBM and a UCR Chancellors Award, for which we are very grateful.